The renowned Italian sport car manufacturer has revealed Ferrari 488 Pista on its official website i.e., auto.ferrari.com. The new Ferrari 488 Pista will be showcased at 88th Geneva Motor Show 2018 which will be conducted in Switzerland from 8th March 2018 to 18th March 2018. 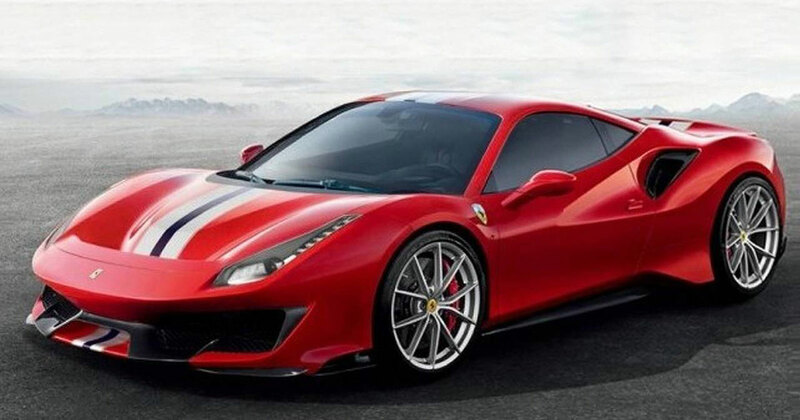 The newly revealed Ferrari 488 Pista is a successor of 458 Speciale which was earlier launched in 2013. It must be noted that the weight of new 488 Pista is about 90 kgs lighter as compared to the 488 GTB. The most powerful V8 engine has been used by the company in the Ferrari 488 Pista which is capable to deliver a maximum power of 720hp at the rate of 8,000 rpm and peak torque of 770 Nm at the rate of 3,000 rpm in the seventh gear. The company claims that it delivers a top speed of 340 kmph and the newly revealed car has a lighter body weight as compared to 488 GTB. According to the reports suggesting that Ferrari 488 Pista is capable enough to accelerate 0 to 100kmph just in 2.8 seconds, whereas the car can achieve 0-200 kmph in just 7.6 seconds. Apart from the twin turbo V8 engine, an additional 50hp in the engine power has been added by the company which helps to provide the most powerful and power- packed engine in the history of the company. The Ferrari 488 Pista is said to feature a 20-inch carbon-fibre wheel-rims for the first time being offered by the company. Some of the other carbon fibre parts such as engine covers, bumpers, and rear spoiler are engaged in the ferrari supercar.